Thanks, Matt. Does anybody know what the ground is like under Queen Anne? That’s a massive file. I clipped it for our use. I’m not well versed on geology – is that just the surface layer? When I’ve seen foundations dug, it looks like a day at the beach; sand and more sand. Sounds like a good thing to me. Maybe this will reduce the complication and cost a little bit. For the art of the project, maybe the could just build the station in the Queen Anne style…. Confusing? How so? The elevators are within plain sight of the road and plaza. Ticket vending machines are a few feet from the elevators, also clearly visible. There are next-train displays (though Link’s real time arrival system still doesn’t work). And ORCA readers are between the elevator doors. I think it’s one of the easiest stations to figure out: one entrance, no confusing mezzanines, no crazy escalators, and no strange positioning relative to other streets. Adding a full station will just cost more money. Its probably more about the lack of turn styles or places to put them. Pretty sure Beacon Hill Station was never intended to be permanently surrounded by chain link, weeds, and gravel. In ten years, There’ll be full-bore residence and retail around it. Remember- the Depression is a long way from over. The ORCA readers are the main thing wrong with Beacon Hill station; it’s too easy to exit the elevators and not see the ORCA readers on the side and forget to tap out. To a lesser extent it’s also a problem going in, again the readers are to the side so you may not see them when you’re looking straight ahead and up at the doors and elevator button. A better design is, if not turnstyles, then at least an archway or something you go through with the readers right in front of you. Most Link stations have problems like this. Designing the entrances better would minimize people forgetting to tap and thus overpaying or risking a fine. I have forgotten to tap out at Beacon Hill station and Kent Station, and sometimes at other underground stations I can’t remember if I tapped in so I have to go back and re-tap twice to make sure. Ah, takes me back to the days of R A Hanson Co. They built some early machines that had some similarities to these VBM’s (for the Saudis? ), but I suspect they were using slipform technology. The concept is similar, but these modern machines are more robust and more automated, and I’m sure faster. In any case, building the shaft isn’t really the hard part – mining the cavern for the station is where it can get difficult. It’s not impossible (we did it at Beacon Hill), but the question is really an economic one – does the ridership potential justify the increased cost???? But Central Link caliber LR is what is needed on this route. If the ridership is really there to justify a QA deep mined station, then certainly Streetcar won’t cut it. Ballard deserves better. I wonder if we could go with a wide bore and minimize excavation at the bottom. Then bridge structures over the top. Of course that’s more material to remove and more concrete in the walls, and I bet that would be more expensive than the excavation. But there are certainly more options now that could change the cost balance. It wouldn’t make any sense to have the vertical shaft be larger than the minimum required. The vertical excavation and the horizontal platform excavations are oriented differently, and a 4 car Link train is 400 ft long. So you don’t really gain much more than a big pile of spoils by going bigger on the vertical shaft. But in all likelihood a QA station wouldn’t be that deep anyhow. So it remains to be seen what technologies make the most sense per construction. The Spanish have developed a method to build deep subway stations without cavern mining. Read about it here. Basically, you use a large-diameter TBM (though still smaller than 99’s Bertha) to drill a two level subway tunnel (conventionally, a separate tunnel is drilled for each track). There is one track on each level, each with room for a side platform at stations. In between stations, inclined crossover tracks can be constructed as needed. Station access can be built using the VSM described in this post; oriented vertically for elevator shafts or diagonally for escalator shafts. You can always dig big holes where you only need little holes. Usually it just isn’t done, and if it is it is only done because of extraordinary circumstances. This is not one of those cases. The tradeoff is that a large-diameter TBM raises the cost of tunneling between stations but cuts the cost of building the stations themselves. But since station caverns are a lot more expensive than tunnels between stations, the tradeoff should reduce costs in most cases. 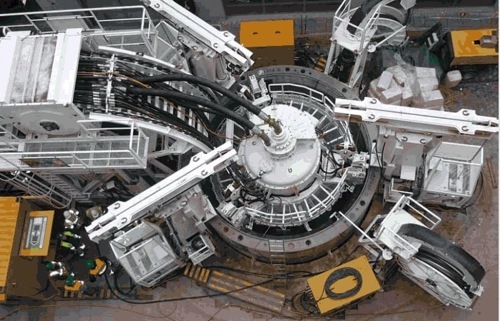 Cheap vertical shafts help reduce station costs further in a large-diameter TBM setting, since they make it easier to build the part of the station that has to be outside the TBM lining. What isn’t obvious is that it would make economic sense to dig 1 to 2 miles of large diameter tunnel to save money on building 400 ft of station platform for a station that in all likelihood wouldn’t even be that deep. It’s an engineering detail, leave it to the engineers. Another consideration: Might be good to design the station so the vertical shaft can be quickly fitted with some heavy-duty elevator equipment. After a serious ‘quake, the subway could be the only clear corridor for rescue and rubble-clearing in a crowded and suddenly-inaccessible neighborhood. Or when it snows an inch. Imagine the ski lift implications of an upper QA station. I kind of like the idea of a Capitol hill to Queen Anne cable car… after we get the train lines in. If nothing else it would be a lot of fun to ride. The only question is whether we’d have the float planes fly over or under the line. Or go under the float planes even after they’ve landed. It isn’t the most common thing, but I remember when I was in Portland, there were a fair number of young people who would take the MAX train from the stadium area to up the Zoo station, then take the elevator up to the surface. With their bicycles. From the Zoo parking lot, one could zip down the winding park roads and city streets to get back to the bottom in a somewhat thrilling manner. If it really becomes cheap to build elevator shafts than Seattle could really benefit, regardless of where they put the trains. They could build elevators like they have in Luxembourg City. For example, you could connect Westlake and Dexter with a BRT stop on Aurora. Or add a few more stops to get you to the top of the hill. Elevators strategically placed in a few spots could not only help public transit, but be a huge boon to bicyclists. How about elevators (plus tunnels) to the waterfront from first or second? I was just in Lux City this past summer. The public main elevator I’m aware of runs between the international court complex and Grund. I think the cliff there is steeper than between Westlake and Aurora. Along, for example, Galer there’s a lot of horizontal distance between the east side of Westlake and the east side of Aurora (I think the staircases there have lifts, so it’s currently an accessible walking route, though it looks harder to use than a public elevator). We’ve got elevators in Pike Place, though, right? And some farther north along the waterfront. I don’t know what their hours of operation are. This technology would possibly be cost-effective enough to renew the discussion of a First Hill subway line. Stations at Harborview, at Madison/Seneca, and at the new Yesler Terrace could be much more feasible. I’d think that these stations would get lots more riders than one on Queen Anne hill. How about extending that proposed Ballard line to First Hill and the hospitals, ending it at 23rd/I-90/Rainier or at 23rd/Jackson? Maybe…. but this is probably decades out. I think a better bet for the short term is getting the First Hill car more ROW. If people actually start riding it (which they will once it opens) you might hear more calls for getting rid of parking and turn lanes in favor of exclusive ROW…. So we could, say, make a tunnel that much deeper (since it doesn’t matter to the horizontal TMB). Interesting. Even if we can only get 85m deep at the station, that’s only a 29m drop to sea level. Anyone know the max grade they’d allow underground? They have quite a bit of horizontal between a Galer St station and the cut. Being one that lives on Upper QA I would not want a light rail station built in our neighborhood. It would take away from the character of the neighborhood and increase the number of undesirables from Uptown/Lower QA and surrounding areas, We don’t need to be another Capitol Hill/Belltown. Why not let it run through the Mercer corridor which is already a transportation hub and bring back the old Counterbalance trolley whose guts still lie beneath QA Ave N awaiting rehabilitation. A separate fee could be charged for the trolley and it would bring back some more of the historical charm of Upper QA. When residents of Georgetown (D.C.) failed to allow a Metro station when they had the opportunity in the ’70s, these were exactly the sort of arguments they used. Today, 35 years later, every last one of those residents realizes how unfounded those fears were, and how badly the lack of a Metro station hurts the neighborhood. And now a Metro station won’t be built for at least 15 years. Don’t give in to fears of the wrong people. That’s the “other” Washington. When I was there in 2011 the subway stopped within a short walking distance of Georgetown(DC). I had become tired of the no-views of the subway coming from NW DC and decided to take a local bus to Gtown to see the sights and what a slow mess it was. Have you been there lately? Looks a lot like Broadway to me except the people there were stressed out, pushy, and rude. Oh, and let’s not forget the Starbucks massacre. I never said I was against public transportation up here, after all we do have busses. I just think it would be nice to bring back the Counterbalance trolley and give some respect to the history and charm of the neighborhood and of Seattle. It would enhance Upper QA even more and probably bring more tourists at a Price. Why spend hundreds of millions to access single-family Upper QA? This is the neighborhood that has fought development and killed several iterations of the Queen Anne Thriftway project. Better to improve connections to Uptown and SLU where there is actual density.